Official website. Best online price guaranteed. When it comes to finding holidays, I usually have only a handful of (not so useful) tactics. For me the first point of call when looking at a destination is surprisingly not the food or the attractions – but instead its the hotels. I start scrolling through Relais & Châteaux’s Instagram feed or other hotel brands, which then ultimately finds me heading onto every other hotel website in history because I’m so indecisive. There really is no method in my madness but it works and it certainly did on this occasion after I discovered Kendov Dvorec. I was scrolling through Relais & Châteaux’s Instagram one cold October evening and came across a hotel called Kendov Dvorec. Something about this hotel enticed me in so much that I took a screenshot and left it as that. But then I couldn’t get this hotel out of my head. I was even dreaming about it at night to the point where I couldn’t take it anymore – I simply had to book it. The story ended there, but started again in January 2018 where we boarded a flight and arrived in the utterly beautiful land of Slovenia. As we arrived at the hotel – the Relais & Châteaux flag was boldly blowing in the air and even the parking area under an exposed barn was a stunning arrival point. As soon as we pulled up at the property, it was everything I’d hoped for and exactly as it was portrayed in its pictures online. 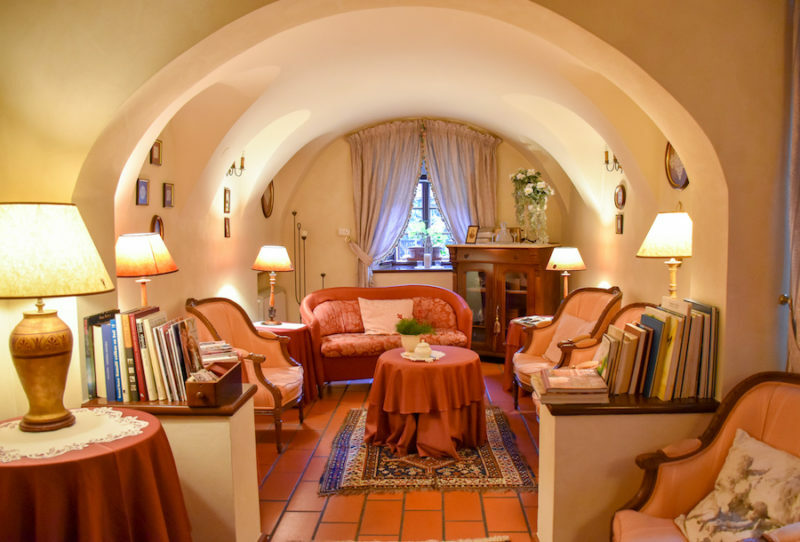 Kendov dvorec is located in the old town of Spodnja Idrija and is a proud member of Relais & Châteaux. Interestingly Kendov dvorec goes back to 1377, when the first landowners managed a farm above the Idrijca river valley. In Spodnja Idrija, a village which has developed since 1156 in the shelter of the pilgrimage Church of Mary on the Rock, the Kenda family successfully promoted economic and cultural development. The magnificent building of the former Kenda family has today been renovated and revived in the spirit of times past. In short – its stunning. We were staying in the hotels master suite during our three days here at the hotel. The room is named after the successful master Matevž from the Kenda family and has been lovingly decorated in traditional Slovenian style. A huge (and very cosy) bed takes centre stage once you pass through the curtains which lead in from the hallway. I really liked all of the lace in the room too which is all handmade in the local town of Idrija, something the village is very famous for with its intricate bobbin lace. I also loved the welcome treats in the room on arrival. A selection of home-made biscuits and a liquor of sorts. I couldn’t quite work out what it was, but it was rather strong! One part of our room I enjoyed most was the bathroom. A very large rolltop bath with views out across the village. One thing you’ll quickly notice about Slovenia is wherever you go the air smells of smoke from the chimneys of almost every house in the country. A smell I find so comforting, especially when it’s pouring in through the windows with the cold air over a warm bath. Our suite even had its very own balcony which was perhaps even bigger than the room. Given this being on the top of the hotel this isn’t real grass but Astroturf. I’m not its biggest fan, so perhaps in the future it’s something which could be improved on – though I don’t know how exactly. It was still such a lovely space at night lit by candlelight or during the day to enjoy a glass of wine or slice of local home-made cake which the team kindly brought to our room. There are so many lovely little areas of this hotel to explore which on a cold Winters day is made even more inviting. Antique furniture dotted around the building, chandeliers hanging from almost every ceiling and rather handsome knight to look after guests during the day. During the evening we got into a bit of a ritual of enjoying a glass of something delicious in the lounge before dinner. This hotel focuses so much on local cuisines and its wines are no exception to that local rule. A very intriguing wine list full of an array of Slovenian wines which I’ve never encountered. My favourite was this local sparkling red which is served chilled. So refreshing but with so much depth and richness. We had two dinners during our time at Kendov Dvorec and so this is really a mix of just some of my favourite dishes we enjoyed. I didn’t quite know what to expect from Slovenian food, but it really was so different to what I’d usually be eating at home or on other trips. Lots of polenta, strained cheeses, hams and an abundance of seasonal vegetables and meats. I loved the warm polenta ball stuffed with cottage cheese as one of our amuse bouches and the smoked lamb starter with horseradish was full of flavour. I also fell completely in love with another starter of local “Bleki” pasta which was served with chunks of succulent rabbit meat and crunchy sage leaves. Star dish of our entire stay was the roasted deer fillet with traditional local pasta known as “zlikrofi”. Idrija is the home to this delicious speciality pasta and has been famous since the mid-19th century for idrijski žlikrofi. This Slovenian speciality is made from dough with a potato filling and pinched into little shapes. A must try when in Slovenia and you’ll see it right across the country. For desserts you have to try two more of Slovenia’s most authentic and popular dishes. My absolutely favourite was the semolina dumpling with applesauce, but equally as good was the traditional “Hana” cured cheese strukli. I can’t even begin to describe it so instead you’ll just have to visit to find out for yourself! As far as hotel breakfasts go, this is up their with the best. Not because they overloaded the dining room with every dessert item in the world, but instead serving a banquet of a refined selection of home-made and home-baked goodies. Local hams & cheeses, dried fruits, DIY muesli, locally sourced fruits and an array of preserves and honey’s – the latter something this country specialises in very well. They also serve up some of the finest freshly pressed orange juice I think I’ve ever enjoyed. We weren’t quite lucky enough to have arrived and seen Slovenia as a Winter wonderland, but instead we had three blissful days of what turned out to be rather mild and very sunny weather. The hotel looks absolutely stunning when the sun is beating down on it and it only reminds me to come back to this hotel during the Summer months. The local village of Spodnja Idrija is very small and in terms of nightlife, well there isn’t one – but it is home to everything you might need with a supermarket, outdoor market, bar and a few restaurants. We had a lovely meal at the local Italian one evening and during the day it’s a great place to walk and take in the scenes and dramatic mountain views. Not to mention the blue waters of the Idrijca River. That time sadly had to come at some point – checking out of Kendov Dvorec and heading back home to London. I really loved our stay here at the hotel and only wish I was back again now. The property was rather quiet during our stay in terms of visitors, being out of season and all – but I loved it that way meaning we got the entire place almost to ourselves. The service was exquisite, the food delicious and the views even better. If you’re looking for an authentic Slovenia stay with a little luxury and beautiful scenery – you really won’t find better than Kendov Dvorec. I can’t wait to return someday.